Good stuff on thermals, thanks for posting it. Regarding waterspouts being harmless and riding through them, your friend is a lucky guy. To date, we've had one kiter killed in Italy, another near fatality at the same time and a kiter permanently paralyzed by yet another waterspout from appearances. All were blown horizontally with substantial force at speed. Waterspouts have sunk boats and played havoc with things at sea since we've been out there. I would avoid them like the plague. Waterspout wind field. Checkout the horizontal outflow component and the undefined vertical component by the shaft. Winds plenty strong enough to mess up a kiter. There are fair weather waterspouts, such as frequent the Florida Keys and Great Lakes. These generate winds on the order of less than 60 mph to around 100 mph, perhaps more. These are associated with cummulous clouds. Then there are tornadic waterspouts connected to supercell cummulonimbus storm clouds. The super cell can throw out lethal winds all by itself without any input from the waterspout. This is a far more common scenario where kiters are concerned. Tornadic waterspouts can develop into as high as F5 tornados on land although rarely. An F1 twister is plenty enough to kill you though if you have a kite up, regardless of kite orientation. Here is a video of a waterspout that went ashore in Australia and turned into a tornado in short order. Checkout the debris field, anyone up for flying a kite through this? Great, just what I was looking for. That is one unusual riding area! An ocean area almost totally enclosed by land with that opening to the north. It also looks quite arid and with the winds out of the WNW (had to ask a native speaker about that), tons of land to generate thermals over. This happened in the afternoon on a sunny day in summer for you folks. Seems like a perfect thermal generation time. Is there much paragliding or hang gliding in the area? I was wondering if there was a land or building feature upwind that might have generate rotor but I think the desert-like conditions cook off thermals fairly commonly? Have you been riding there for a while, do you see dust devils or spinning columns of sand very often there? The amount of dust they carry depends of many factors. The 5 to 25 kt. wind range is fairly extreme. What do you attribute that to locally if you have any idea? ok dude, here it goes. Sky: Clear - Sunny. No clouds at all. Objects: 2 cars. 5mts far. I´m not a pro rider, but i´ve riden in a lot of difficult conditions such as 50knots, huuuuge waves, etcc....but i´ve never seen it comming, it grow up from nothing and in 2 sec i was going up. Did some digging, yes you have dust devils in the Patagonia Desert, lots of them. There is also hang gliding and paragliding in all those desert thermals. I think they are a main factor that shapes the desert land forms and shifts vast quantities of dust around. You may know them as "tolvanera." Your accident at 1400 was at prime time for tolvanera development, frequently between 1400 and 1600 on clear, sunny days. You can have them in cloudy days too. As a rule the winds are below 60 mph (100 km/hr) which is plenty to take you out with a kite. You had two lines break which may have helped your situation a great deal. Which two lines broke, where and when? Were they old, any idea why they broke? When do you see tolvanera there? "A dustdevil is a whirlwind into which dust and debris gets caught up, making it visible. Dust devils form through a different mechanism than tornadoes, and are much smaller, usually only 10 to 50 feet in diameter, and usually not extending more than 100 feet into the air. They usually are seen in relatively dry conditions, when sunlight is providing strong heating of the surface, and when winds are generally light. 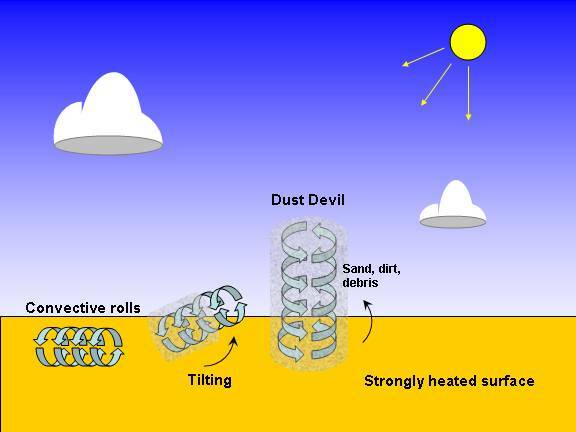 The heated land surface can start to produce convective rolls of air (as in the diagram above). Some of these rolls can get tilted upright, producing a dust devil." A clip in German, still the visuals carry the points well. There is an amazing sequence of two paragliders being pulled aloft into one and a number of hang gliders being tossed about in others. Here is another one, you really don't want to have a kite up in one of these. One last question, have you ever been shocked by your kite bar? With the normal dust loads in the air, there is the potential for some pretty strong static discharges to occur. The stronger the wind and more dust the stronger the shocks. As to dealing with this, you might talk to some kiters in Nevada, Colorado and Utah on here. Lots of dust devils there including some I heard about involving kiters in Nevada. p.s. - nasty incident and accident in Oahu with that dust devil Windrider. Sounds like a strong one.